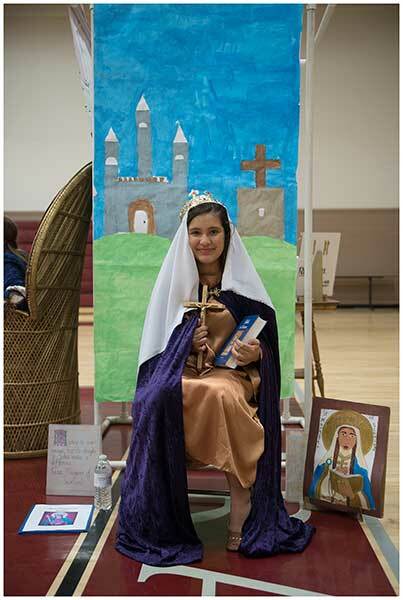 Jasmine Ochoa-Tolento, a sixth grader at O’Hara School in Eugene, portrays St. Margaret of Scotland. Each year, sixth graders at the school study a saint or blessed and all kinds of projects follow, from map making to dramatic portrayals. EUGENE — At the end of last school year, nearly 1,000 people from all over Oregon visited O’Hara School for a self-guided, inspirational journey of the heroes of faith. medieval art of illuminated manuscript and the prayerful art of iconography. Students apply knowledge across many subjects. Representing 50 saints and blesseds from five continents, students in costume shared stories and artwork. They offered examples of faith, hope and charity. The Living Saints Project was started by sixth grade teacher Maryanne Obersinner. The annual project was awarded the 2008 Innovations in Education Award for Total Community Involvement by Today’s Catholic Teacher Magazine. sixth grade class of 2014 were a featured exhibit at University of Portland’s Buckley Center Art Gallery. Obersinner was named one of 12 Distinguished Teachers of the Year for 2009 by the National Catholic Educational Association.